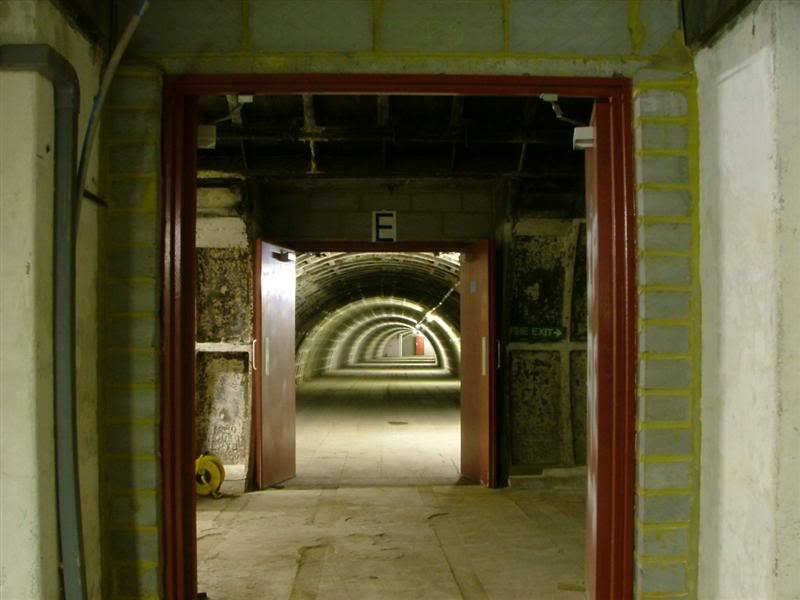 Above ground, each shelter's shafts were protected by specially constructed 'pill box' buildings to prevent any bombs that directly hit the location from going underground. 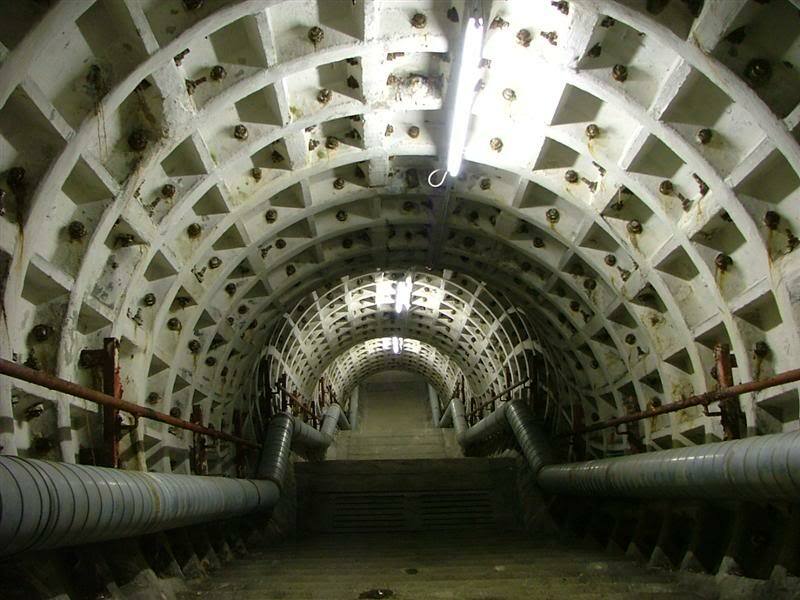 Each pill box housed lift machinery and provided the cover for spiral staircases down to the shelter's tunnels. 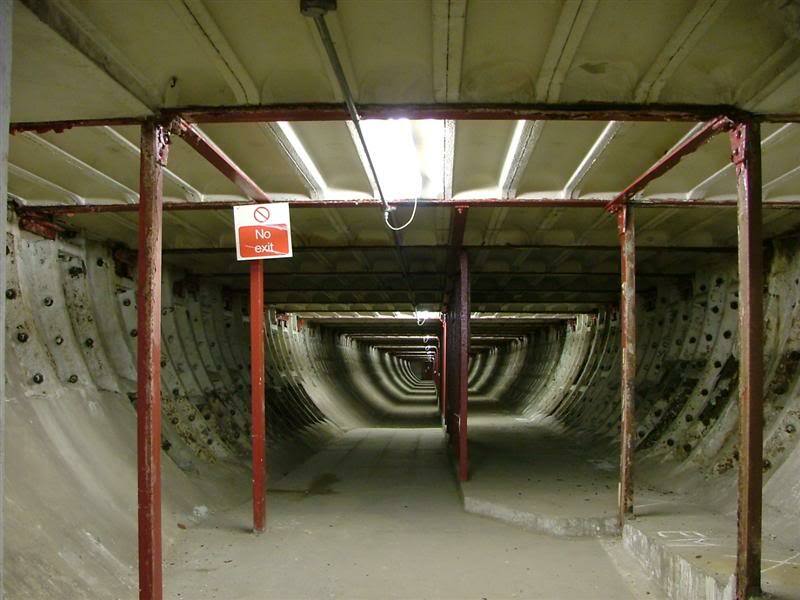 Each shelter consisted of two parallel tunnels that were 16ft 6in (approx. 4.9m) in diameter and were 1400ft (approx. 427m) in length. Two pairs of shafts were sunk for each shelter, with the pairs being sited a distance from each other in case a bomb struck, blocking a shaft. 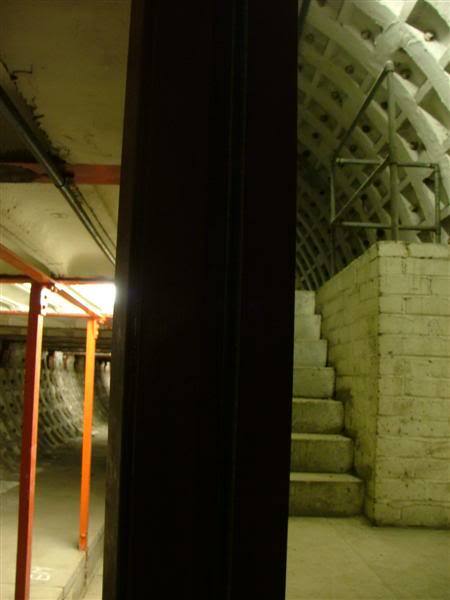 At each location, one shaft was for the spiral staircase and lift, the other a narrower ventilation shaft. The two tunnels were interconnected at various places along their length. 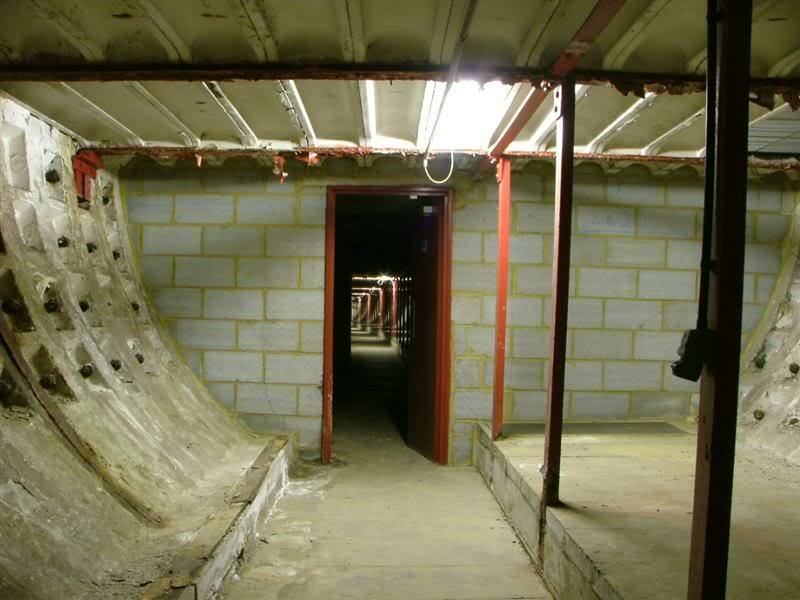 A floor was constructed at the horizontal diameter level of the tunnel, providing two decks of accommodation. 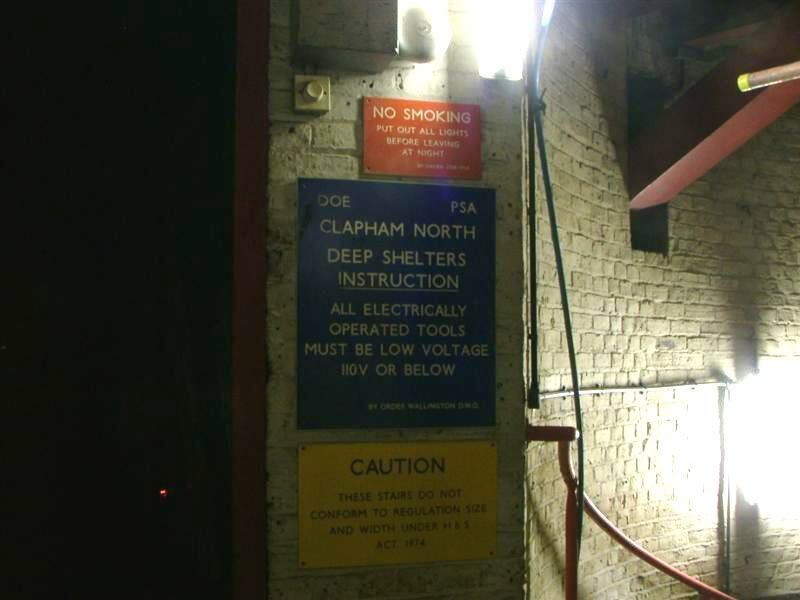 Ventilation, medical, and catering facilities were provided and electricity was obtained from two sources in case bombing caused one to fail - the local authority and the London Underground system, which had its own power station at Lotts Road. The spiral staircases were constructed in the form of a double helix. One staircase would lead to the upper deck, the other to the lower. This was to allow shelterers to be able to quickly access their destination deck with minimum confusion. On the whole, the upper and lower decks were run independently, though access between decks was provided in the mid-point and at both end of the tunnels. The lift would have access to both upper and lower decks, but was not meant to be used by shelterers. Each shelter was originally designed to house up to 12,000 people but by the time they were built, the number of bunks had been dropped to a more comfortable 8,000. Bunks were arranged along the walls in various configurations, to maximise use of space. As Brian Cox (the actor - or was it Brian Blessed?) once said about it "There are 2 tubes which are parallel â€“ youâ€™re in one which weâ€™ll call â€œhereâ€, and the other is, well itâ€™s â€œthereâ€. You arrive in the middle and can go â€œleftâ€ or â€œrightâ€, and the tubes are split along the middle into either â€œtopâ€ or â€œbottomâ€. I could tell you about the double helix stair or the infinity-symbol shaped cross passages, but youâ€™d probably guessed those bits already. Itâ€™s big and empty and the tubes are curved â€“ well of course itâ€™s a metaphor for space time. Thatâ€™s basically it â€“ it was designed by a quantum physicist with a sense of humour"